There are many advantages owning a fiberglass swimming pool. There are also many misconceptions floating around regarding possible downsides to having a fiberglass pool. The last couple of years has seen an explosion in the fiberglass pool industry as more and more people are seeing the advantages it has over traditional concrete and vinyl liner pools. 1. Fiberglass pools will pop up out of the ground. This is a common misconception among pool owners, that fiberglass pools will pop up in bad weather (ie: wind or big storms) or float post-installation. This is in fact impossible, as the concrete deck that the pool is installed in covers the outer edge of the pool, meaning that the pool has no way to move unless the deck moves with it. Moreover, your pool will always be full of water, which would weigh it down in the first place. 2. Fiberglass pools do not work in cool climates. This is a very strange misconception, because fiberglass pools are among the most malleable of pools, more so than any other type of permanent pool. There are tens of thousands of fiberglass pools here in Canada, if they were popping out of the ground during the Winter, I think we would have heard about it by now. Fiberglass is very flexible and strong, and freezing conditions will not affect such pools in a negative way, as water in a pool freezes and expands upwards (which is not blocked by anything). Thus, your fiberglass shell will not be damaged or affected in any way due to cooler or freezing temperatures. 3. Fiberglass pools look cheap. a problem. In fact, fiberglass pools are an affordable and permanent-looking option that houses of all types will find an aesthetic fit to. You can choose between coloured pool finishing, ceramic tiling, mosaic inlay tiling, fibre-optic lighting systems, and so many other features to customize your pool to your exacting standards to make sure it fits beautifully with your home. 4. Fiberglass pools are a lot more expensive than vinyl liner pools. While initially and on the surface, fiberglass pools can cost five to ten thousand more than a vinyl liner pool, those who claim this are not considering the expenses of the pool over the course of its lifetime. The cost of replacing liners can really add up over the years (average cost per replacement is about three to five thousand), just like how concrete pools that have to be re-plastered. 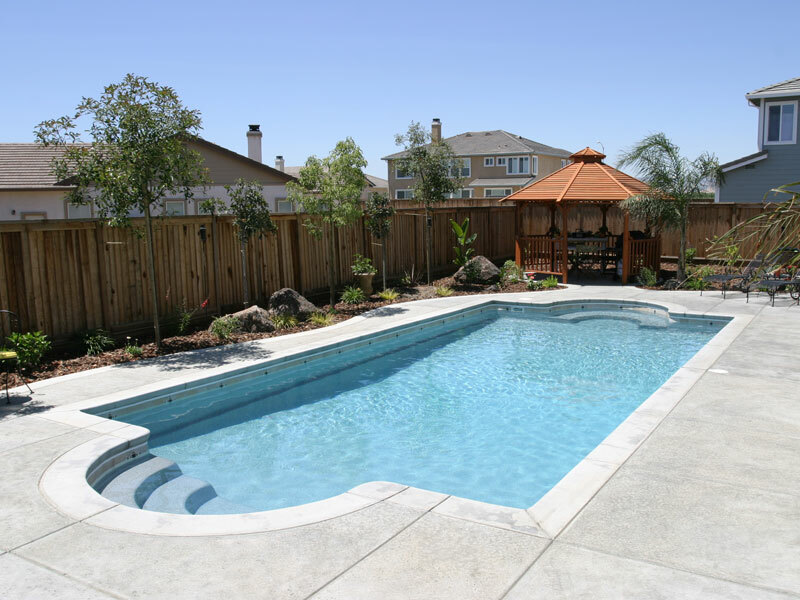 A big advantage when choosing a fiberglass pool is that there are rarely any large expenses after the initial purchase to worry about, so the bigger initial cost will save you money in the long run. 5. It doesn’t matter which manufacturer I choose because they’re all the same. Fiberglass pools are awesome, and we’re not just saying that because we sell them. They offer the most flexibility when it comes to balancing budget, style and ease of maintenance and is the right choice for most types of in-ground swimming pool installations. If you have any questions about fiberglass pools or would like us to “myth bust” anything you’ve heard about them, feel free to contact us here.